Use tyre sealant as a preventative measure to improve up-time and eliminate puncture related down-time and protect your vehicle fleet for a fraction of the costs normally associated with a puncture. Tyre Sealant comprises of a carefully formulated blend of natural fibres, blocking agents and sealing compounds that’s been proven to seal a puncture of up to and above 18mm. Add Seal puncture and tyre repair saves money and downtime. 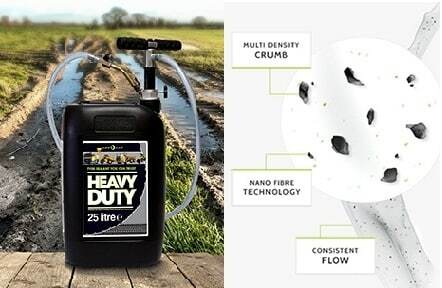 It can be used as a preventative measure for wide a range of vehicles and different tyre sizes from large agricultural tractors and to quad bikes and even lawn mowers! Work may stop for many reasons, but a puncture need not be one of them! Tyre sealant can be applied onto a multitude of different vehicles to prevent punctures & the downtime involved in fixing them. Farming is difficult enough without suffering a puncture and having to wait for a recovery vehicle or tyre maintenance expert. Using tyre sealant you can protect all of your vehicles for the life of the tyre and make puncture related breakdowns a thing of the past. The construction sector works on tight deadlines and a simple puncture can jeopardise targets that if breached, result in financial penalties and costs over and above call-out charges and repair costs. Many industries rely on challenging conditions under which material handling equipment, such as lift trucks, must operate. Punctures occur and in doing so, jeopardise already tight deadlines and indeed, safety. You can install Tyre sealant yourself as we supply pumps, training and tyre charts that state the recommended dosages per tyre to make life easy. If you wish to use our installation service, our service engineers are based throughout the UK and in many cases are capable of installing tyre sealant without deflating the tyre, saving time and money. Stop Your Punctures Now - Buy Tyre Sealant Today!